Upper West Side residents meet with DOT to discuss pedestrian safety issues. This piece was published Feb. 6 in the West Side Spirit. A meeting called last week by Community Board 7 to discuss pedestrian safety on the Upper West Side became an outlet for the deep sadness and anger felt by many after a series of fatal accidents in the neighborhood. In January, three pedestrians on the Upper West Side were killed in separate incidents after being struck by vehicles. Perhaps the most wrenching was the death of Cooper Stock, a nine-year-old boy who was struck and killed by a cab at the intersection of 97th Street and West End Avenue. Stock was in the crosswalk, holding his father’s hand, and the two had right-of-way. Inspector Nancy Barry of the 24th Precinct speaks to the crowd at the meeting. The meeting was called so the Department of Transportation could unveil safety measures it’s proposing at 96th Street and Broadway, the same intersection where the two other pedestrians were killed: Alexander Shear, 73, the same night Cooper died, and Samantha Lee, 26, 10 days later on Jan. 19. The safety proposals at the intersection include banning left hand-turns from 96th on Broadway, and banning left-hand turns from Broadway heading eastbound on 96th Street. The DOT is also calling for expanded pedestrian space on the northeast corner of the intersection and new crosswalks, as well as simpler signal phasing for cars and pedestrians that will “significantly” improve the travel-time for the latter. Overall, the DOT said, the improvements will cause less confusion and lead to more natural compliance with signals. The DOT’s Ryan Russo said the agency would like to begin implementing the improvements as early as March, after taking into account the input from residents and CB7. “We’d start in March and probably finish in March or April,” said Russo. The DOT was commended by residents and local leaders who spoke up at the meeting, and their proposal was characterized as a good starting point for fixing safety issues on the Upper West Side. But the almost three-hour meeting was also a forum for residents to talk about safety issues they see in other areas of the neighborhood. What has made this recent spate of tragedies particularly difficult is that residents, and local leaders, said they’ve known for quite some time that serious safety issues exist on the Upper West Side. Findings from a pedestrian safety study commissioned by CB7 last year, and released in September, included examinations of both locations where people were most recently killed. The study looked at a swath of the Upper West Side from 94th Street to 96th Street between Central Park and the Hudson River. The crowd implored CB7, local leaders, the DOT, and members of the 24th precinct to crack down on aggressive drivers. 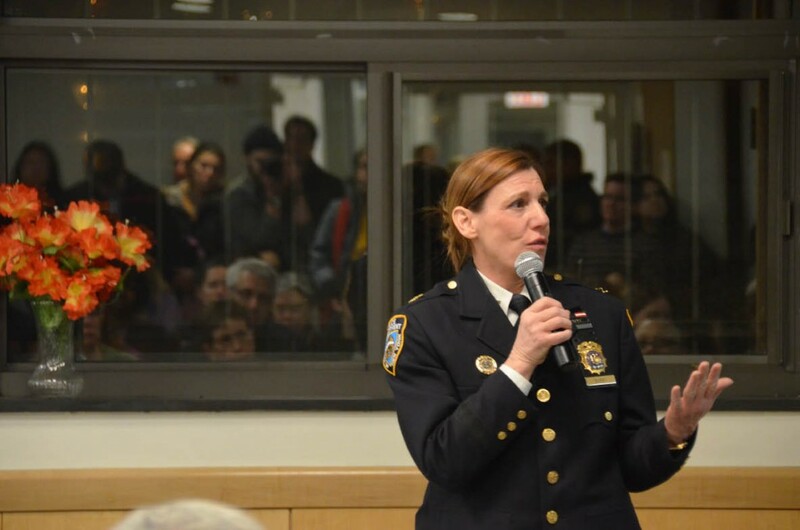 To that end, 24th Precinct Inspector Nancy Barry touted her department’s recent crackdown in the area, saying officers gave out 79 summonses in January for failure to yield to pedestrians, an increase of 182 percent over the same period last year. But her precinct was criticized for what locals perceive as a focus on ticketing pedestrians, especially after a high-profile incident in which police roughed up an elderly man at 96th Street and Broadway, allegedly for jaywalking. “Cyclists and walkers do not kill innocent people. Cars driven by reckless and distracted drivers do,” said Barron Lerner, Cooper Stock’s uncle. Lerner underscored the tension that has bubbled up – much of it online – between pedestrians/cyclists and motorists, who blame non-motorists for putting themselves in harms way. “There’s nothing we can do for this family, they’re not going to get their child back. But what we can do is enforcement, to show the community that we’re out there,” said 24th Precinct Inspector Nancy Barry, voice cracking, after holding a moment of silence for the victims. Lerner also highlighted bureaucratic obstacles to improving safety, including state oversight of the city’s traffic laws and control over the allocation of funds for things like traffic cameras. State Assemblyman Daniel O’Donnell recently introduced legislation that would reduce the city’s speed limit from 30 to 20 miles per hour, but said he needs a home rule message from the City Council to let the state know it’s behind such an initiative. Helen Rosenthal, the newly elected councilwoman for the Upper West Side, said mobilizing state support is key to improving pedestrian safety in the city. She’s working on building support to increase the fines for motorists who fail to yield to pedestrians. She’s also a major proponent of lowering the speed limit to 20 miles per hour. Fellow councilmember Mark Levine said the time to act is now. “Momentum to change the pedestrian safety laws in New York City has never been greater,” he said. This entry was posted in News and tagged Cooper Stock, Dept. of Transportation, New York, New York City, traffic safety, Upper West Side. Bookmark the permalink.